Slap Fries? Srirachannaise? Viblanco's heavily spiced oven fries just sound like a party, and in fact taste just exactly the way they sound! 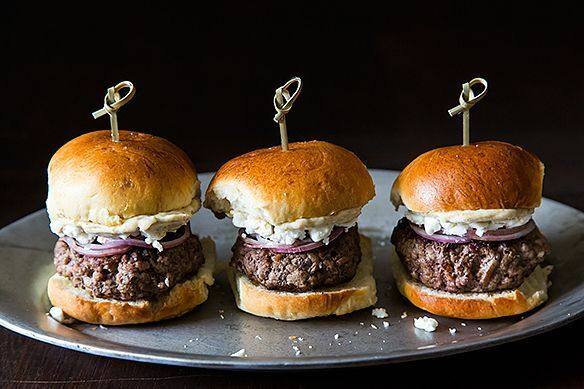 And as for daisyt13's feta and cumin-topped lamb sliders, well they simply demand to be held (and nibbled) daintily in one hand, while you sip from your New Year's Eve bubbly with the other. It's dinner tonight, but it's also the bulk of a perfect New Year's Eve spread! Just ask a friend to bring dessert, add bubbly, and maybe a sweet little sequin number and presto! A marvelous -- and marvelously delicious -- celebration that, as always, comes together in just about an hour. Cheers! Click through on the recipe photos or titles to see (and save and print) the full recipes, but we've also written you a handy grocery list and game plan below. 1. 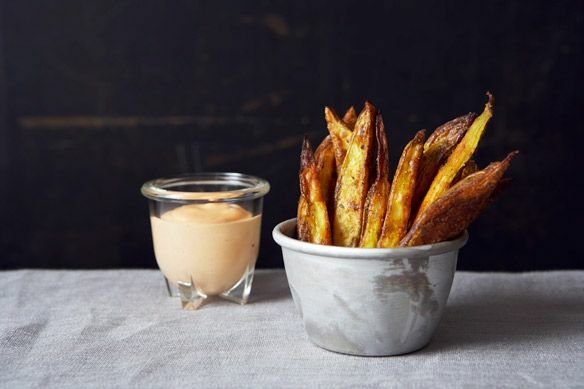 Whip up the two flavored mayos (cumin and sriracha) and set them in the fridge. 2. Slice the potatoes, season them up, and place them in the oven to roast. 3. Season your ground lamb, form patties, and heat a cast iron skillet. 4. Cook the patties to your desired degree of doneness, and assemble the burgers. Pull out those slap fries and serve with lots of the flavored mayo on the side. Toast to a wonderful 2012 and to many good things to come in 2013! Alternatively, toast to simply getting dinner on the table, that's always celebration-worthy achievement. Salute! I love Champagne and cheese and potato chips. In fact, that would be the most dreamtastic dinner. I have two cats and I am a proud Portlander-by-birth currently residing on Manhattan's rich and wonderful Lower East Side in a closet that has no closets. In May I finished up a masters degree in Food Studies at NYU and now I am trying to figure out exactly why I did that and what that all means. It is very fun and scary but mostly fun. I like to cook and I love to bake.